September, the time just flies by. So for all the new grandparents out there make the most of your babies because in no time at all they will be starting school. large B. The letters are from the Alphabet set, and the papers are from the bug Helidot papers. with the red, black and vanilla plain card from my stash. To make the large B with the peeping fairy. Glue together the two circles as shown in the picture and glue the small flower in place. Add two black dots for the eyes and a red pearl for the centre of the flower. wings behind the large B.
large B so it looks like the fairy is peeping over the top. You can now add any letters you like or just leave the peeping fairy as it is and use as a topper. I will be back soon with some more ideas have a lovely weekend and enjoy the beautiful sunshine. As promised here is another card for you to make this time it is used with the Bee Set. so this is a good way to use them. You will need to cut 3 thin stems for your flowers from green card. 1. Cut a square 7.5x7.5 cm. from vanilla coloured card. no.1103 and 3 hearts from sheet no.1105 all in red card. Peel off and cut out 1 pot shape from sheet no.1103 and 1 circle in black. 4. Make the flower using the 5 red petals using the waste from the circle you have cut out. circle to the centre of the flower. sticky circle from the sheet. Position the butterfly onto the edge of large black circle. (see picture) using 3d pad. Hope you like this card , you can make it in so many different colours have a go. I will blog some more ideas very soon. all have the following Bank holiday to look forward to. so may lovely things with this set I think it is so versatile, I really hope you will agree with me. slightly darker yellow, 1 stalk in green and two leaf shapes in green. leaves onto the yellow shapes and glue to a green stalk. You will notice that the two different flowers are made from the same shapes. cut out one shape( as shown for the body) in darker lilac glue to the middle of the petal shapes for the body. To make a larger butterfly just cut out 4 larger petal shapes. shape glue this to the centre of the petals and glue a circle on top. available to buy as rubber stamps as well as peel offs,which are on sale from the online shop. Have a lovely week and I will post some more flowers next time. Hope you have had a good week, can`t believe Easter is nearly here already. Hope you all have an enjoyable long weekend and I will blog again soon. Glue the circle onto the top of the yellow fish shape. Glue the trimmed orange star shape onto the head for the beak. Glue the flower to the centre of the oval (Easter Egg) and adhere to the card using 3d pads. Make up two chicks and using 3d pads adhere a chick either side of the egg shape. Glue the yellow circle onto the yellow oval, then glue the feather shape to the back of the oval to resemble feathers. (see picture) glue the heart shape onto the bottom of the oval sideways to resemble feet. Trim star shape and glue to the circle (beak). Lastly glue a black dot for the eye. You could also use this chick with the Easter egg shapes, try cutting the egg in half and the chicken in half and glue the top of the chick inside the egg shape. Have fun with these shapes you certainly don't need many to achieve a small card. I am always interested in what you make with the Helidot peel offs and I would always put them on my blog if you were happy for me to do so. lots of chatting and we even made some cards. and another piece ... 60x70mm , then a piece of lemon card measuring 75x65mm. then matt and layer these three pieces of card, repeat again for the back of the card. Cut a piece of lemon card 240x60mm score at 60,120,180mm and glue to the back of card (see picture). For the sleeve cut lemon card 170x30mm and glue together making sure the finished sleeve is big enough to take the mini card book,adhere add a little bee to the front of sleeve. If you want to 3D any images from the sheet always adhere them to a piece of thin card first and then cut out the shape. Hope you enjoy making this, I will be back soon with some more ideas from the sticker sheet. You will be surprised how many cards you can make once you get going. Petite Fleur and All about Babies. If you dont have all these sets, try and use what you have. when you really study the shapes. Cut a piece of Willow spot paper 4.5cm x7.5cm. Then mat and layer onto dark green card 5cm x 8cm. This is the topper base. Peel all the shapes onto coloured card and cut out. Make the daisy flower using five white petals and a yellow circle for the middle. Using the waste from the circle adhere each petal onto the sticky side of black waste(see instruction sheet). To make up the flower pot trim the triangle from the pointed end as per picture adding a black sticky line along the edge.Glue this to the topper and adhere the yellow mini heart in place. the finished daisy onto the stalk. small black circle in place for the head. Finally glue the ladybug onto the side of pot adding the black waste from the antenae. Hope you all enjoy making this little topper. Be back soon for some more samples. As promised my instructions (I hope you can understand them) for my little house in the forest. Willow paper with spot and chalked around the edges with darker green chalk. measuring 70mm x 80mm. This makes the topper base. of the two roof shapes where they join. Glue the chimney in place at the back of the roof. Glue the windows in place after using the black lines to make a criss cross design on each one. Glue the door in place and trim the bottom.Add a dot from the sheet for the handle and add glue a small heart on the door (optional). each flower centre and the heart smoke from the chimney. You can make up a card to your own design or just use the topper in the centre of a card blank. Have a good week and I will be back soon with some more ideas. Apologies for not blogging for so long but life in the Helidot house has been a bit fraught for the last year due to illness. Hopefully now we are back on top of it I will be posting some new ideas, watch this space. I thought I'd post a picture of some of the sample boards that go to shows with me so people can see the finished creations. Don't forget there is also an easy step by step guide showing you how to use Helidot peel offs. It's that easy even kids can create cute little cards and projects using Helidot peels offs and stickers. All these can be bought from the website Helidot.com just click the link and voila you're in the shop. 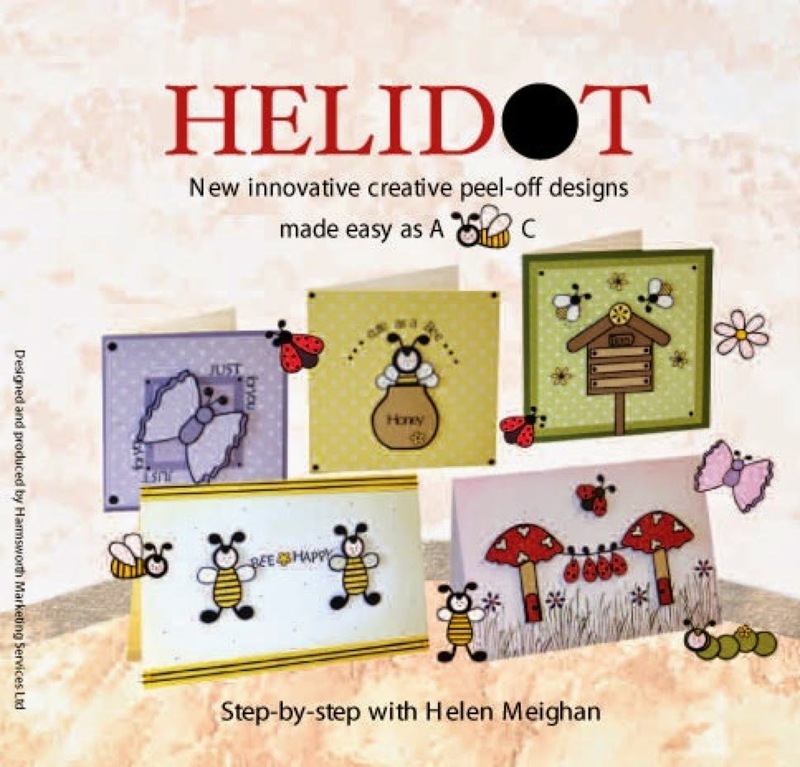 The Craft Barn had a workshop last week using the lovely Helidot Bugs and Friends stamps set. The lovely Carole Staples decorated this box and isn't it just one of the cutest things ever!